Getting back home after a holiday is always difficult.Especially when we are driving down.We had one full day of driving from Cochin to Chennai and I wasn't making things easier by sitting with a sulking face:).We had a stop over at Palakkad where we picked our friend and his wife for company.His mom had prepared delicious breakfast for us and we just couldn't wait. Piping hot dosas with two kinds of chutney and a tall mug of chaya(tea) was all it took for me to get back into my own self,chatting and smiling and eating at the same time.The dosas were crisp and spicy and I couldn't guess what it was made of.Having not tasted adai dosas before,I just couldn't stop myself from having at least 3-4 dosas.I'd thought of asking aunty for the recipe but the cutie doggy named 'pepsi' diverted my interest and then it was time to leave. I asked many people for the recipe and got so many interesting ones at that.The closest one I think was Sharmi's recipe and I tried it with slight changes.Paired with coconut chutney and tomato thokku,this was one delicious breakfast I didn't mind waking up early for! Soak the rice,dals and red chillies together for 1-2 hours. Grind to a smooth paste.Mix in the onions,salt,turmeric and hing and grind again. 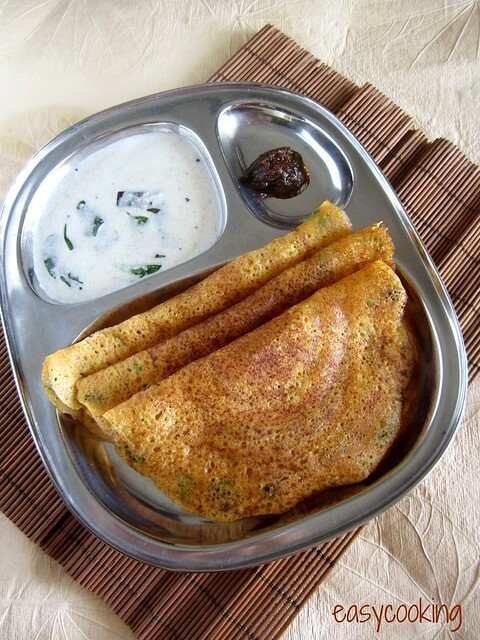 Heat a dosa tawa and smear some oil.Wipe with a tissue(this ensures the dosas would come out smoothly without sticking to the pan). 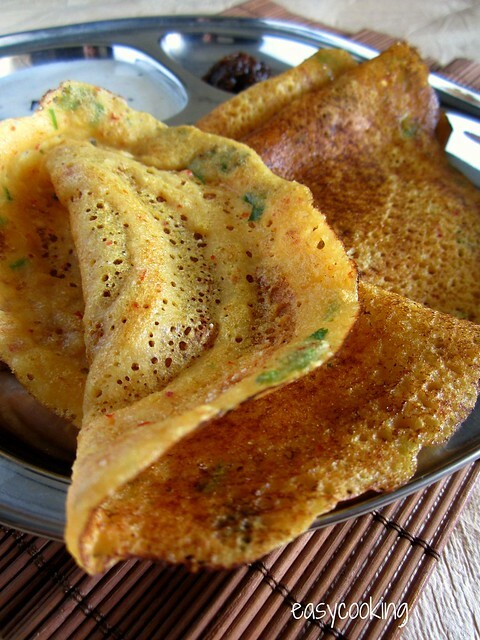 Pour one ladelful of adai batter and spread into a thin circle.Drizzle a tsp of oil around the dosa,cover and cook for 10 seconds. Remove the lid and flip over the dosa and cook for another 15 seconds. The best combination for this dosa,I am told is Avial.I've also heard suggestions to try it with jaggery.Love the options. 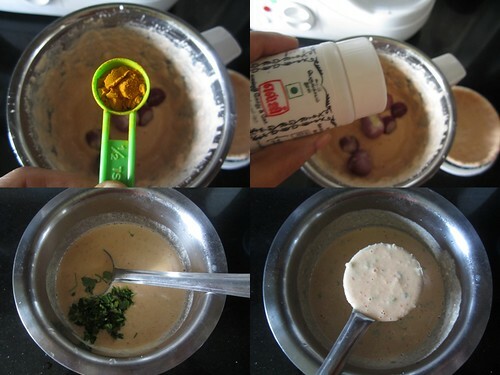 You can add chopped onions and ginger in place of small onions after the batter is ground. The batter does not need fermenting and you can make adais as soon as you grind the batter.The batter can be refrigerated in an airtight container for a day. adai looks very yummy. I am feeling hungry for breakfast. I've heard jaggery and ghee is a great combo too-got to try that next! I had also posted a comment under homemade potato chips - don't see it either. Raji. Hi Divya thanks for the recipe! 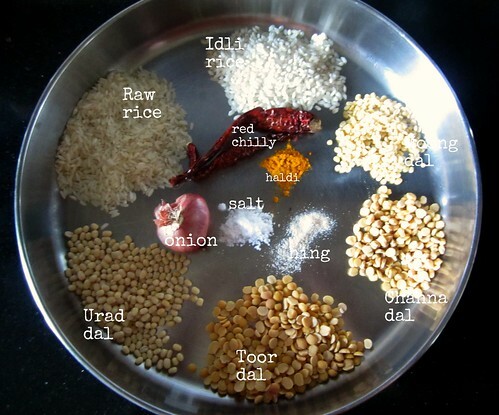 Ok I am a novice cook but what is the difference between raw rice and idli rice and the regular basmati rice I have at home? Can I make adai by simply using the basmati rice? Thanks! 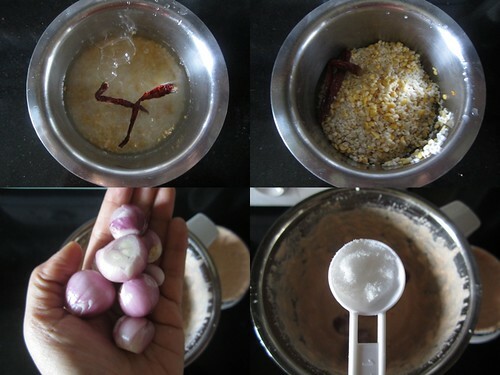 Idli rice is exclusively used for grinding idli/dosa batter.You can replace it with raw rice. I modified my recipe accordingly and tried this. Made my day :) Amazing recipe.